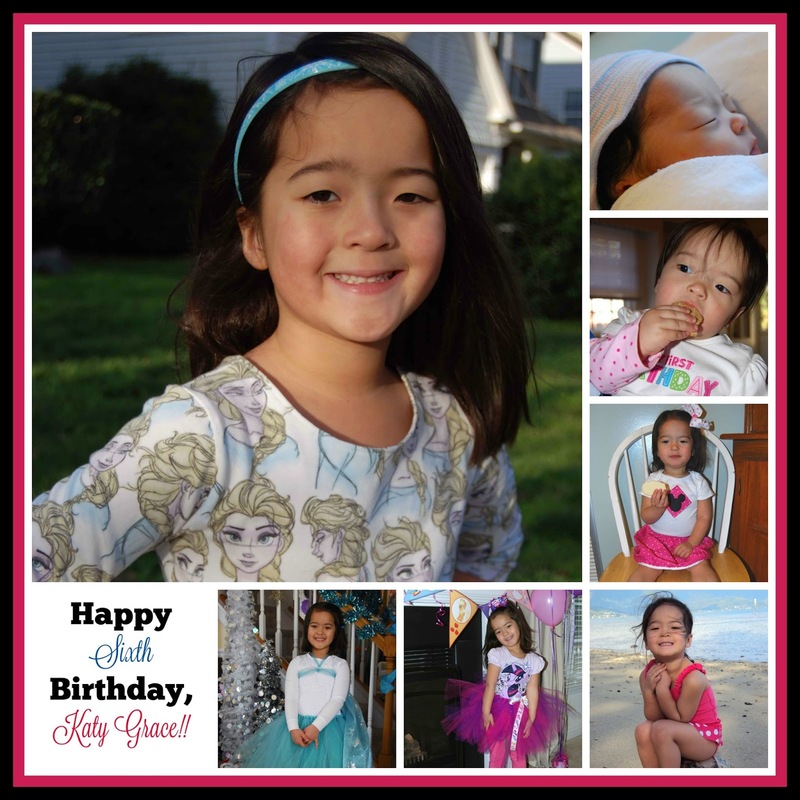 Happy 6th Birthday, Katy Grace!! 100 Days of School- 100 Days Smarter! This past weekend, we took a super, duper, really QUICK road trip to see my maternal grandmother in PA. It was a whole lot of driving for not a whole lot of time on the ground but it was so worth it and necessary. Katy, "I only got one measly onion on my sandwich!!!" Hahahahaha.... there is so much about that conversation that makes me smile... Most of all, though, Katy makes me smile!! I had the opportunity to test a new dolly sewing pattern for Cole's Corner and Creations. 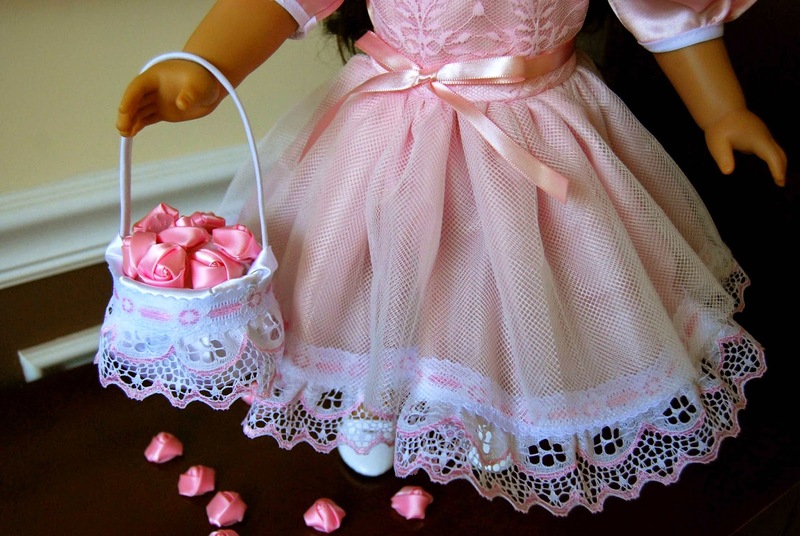 Introducing, the Celebration Dolly Dress!! 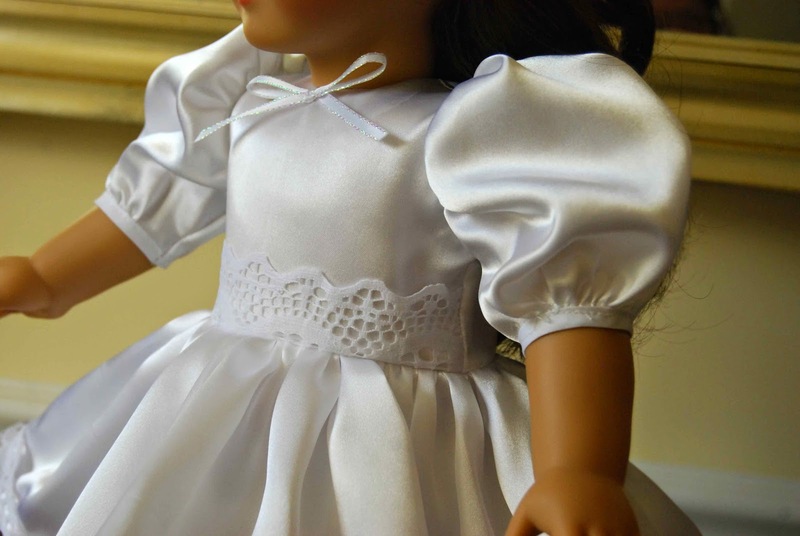 This puff-sleeve, fancy dress is the perfect special occasion ensemble for all of dolly's dressier events. 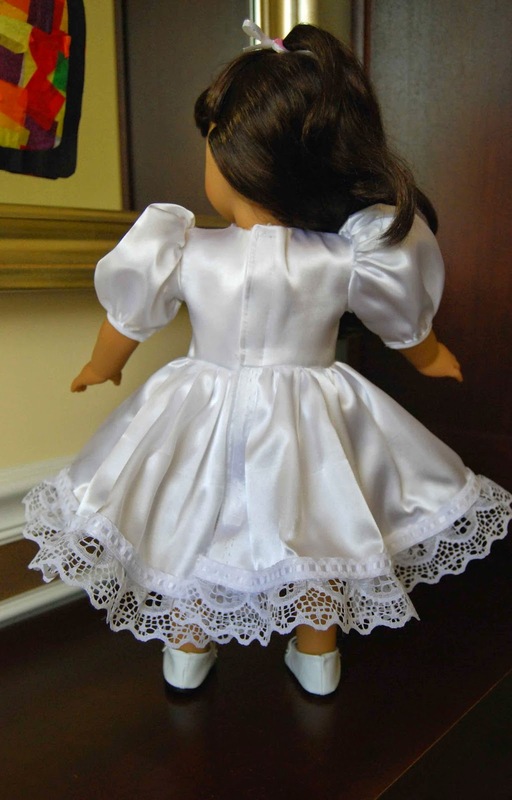 This includes dolly's First Holy Communion, Baptism and Flower Girl! Lots of fun! 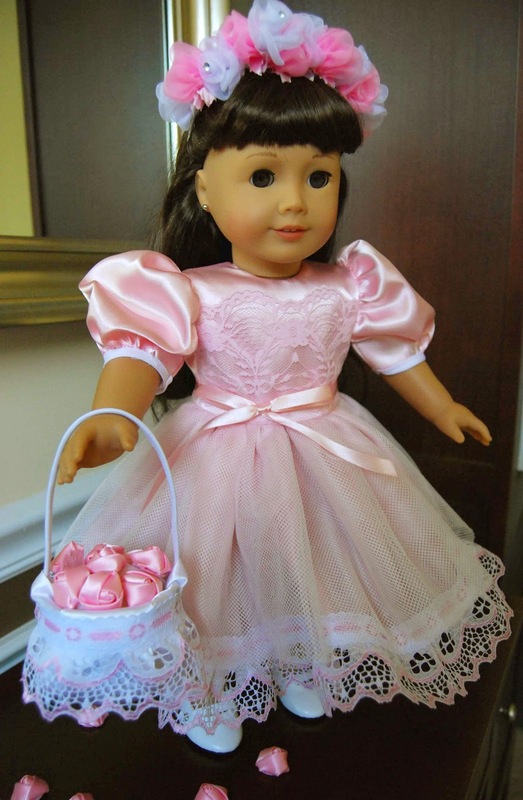 The Celebration Dolly Dress pdf sewing pattern is written for 15" and 18" dolls. I sewed up the 18" doll. Pattern pieces are for the bodice and sleeves, only, and there is a cutting chart for the skirt and armbands. This is a quick sew with lots of bang for your buck. One dress takes less than 1/2 a yard of fabric (minus trims and any other additional details). 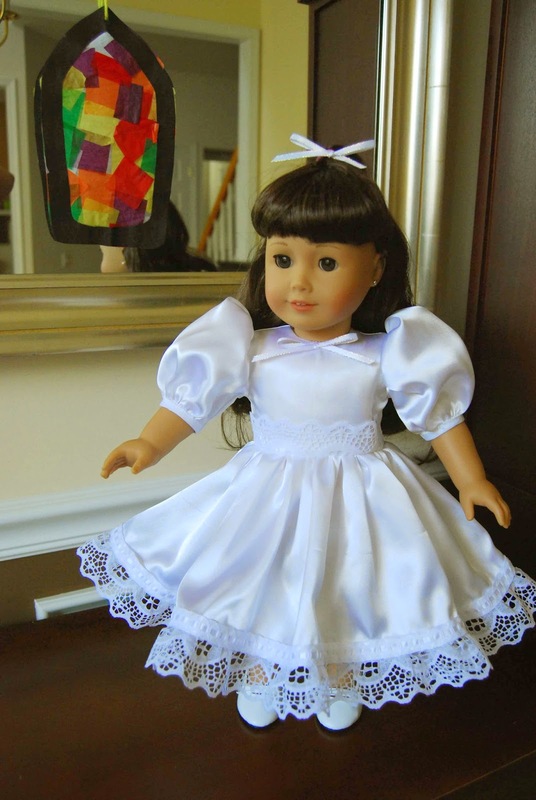 The first dress that I sewed up was the white, First Holy Communion Dress. I added lace trim to the bottom hem and a small lace overlay to the bodice. I used pre-made bias for the armbands and added a small white ribbon bow to the bodice. 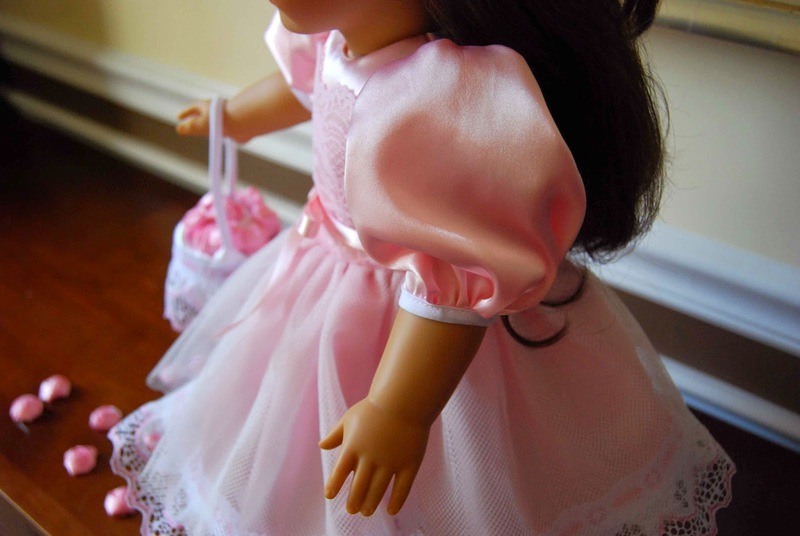 The second dress that I sewed up was the pink Flower Girl dress. Lil' Miss was a flower girl for my cousin's wedding, last spring So, she was really excited to have a fancy flower girl dress for her doll, Samantha, too! I added lace trim to the bottom hem, a lace overlay at the bodice and a tulle overlay skirt. 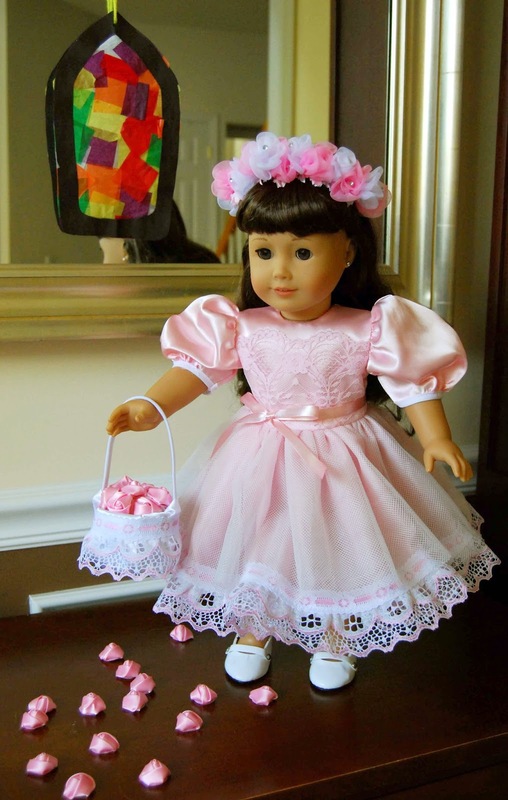 In conclusion, the Celebration Dolly Dress is lots of fun to sew up! 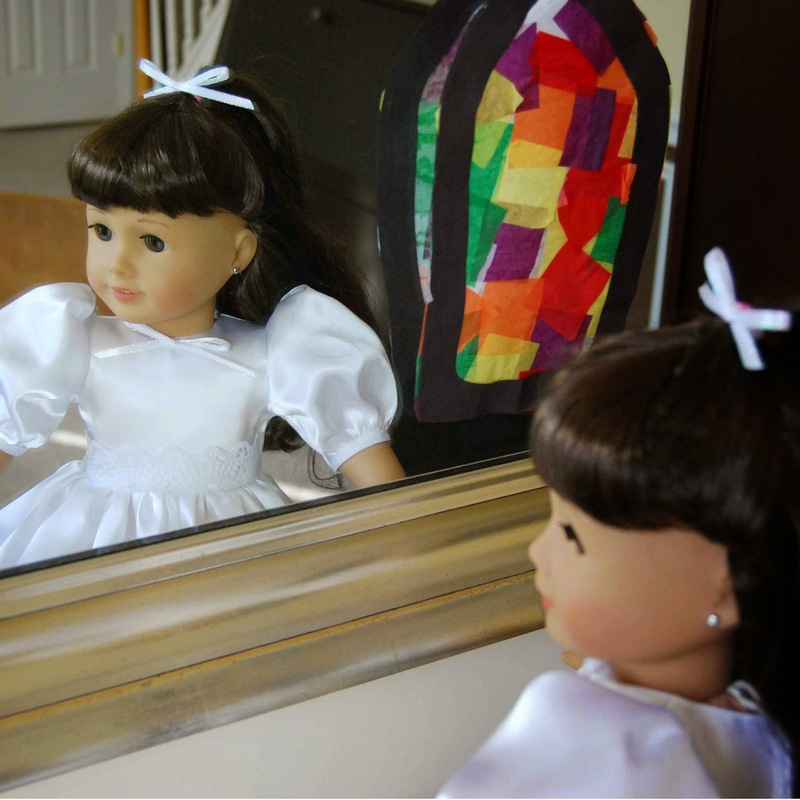 The little girls (and dolls!) in your life will love it! Thanks, Nicole, for allowing me to test this adorable pattern for you! She's sweet and she is sassy. She is beautiful and she is smart. She is fiesty and she is kind. 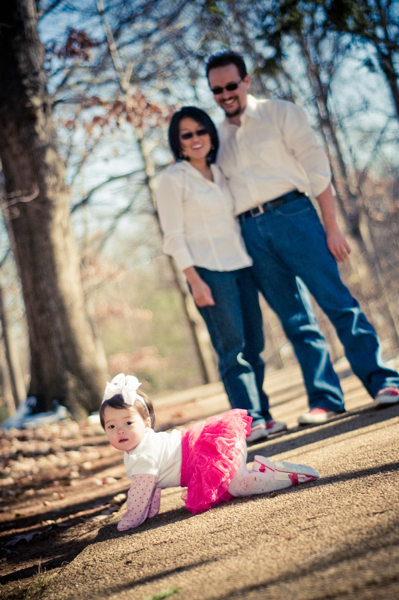 She makes us laugh and yes, there are times that she can make us cry (because as any parent will tell you, Love is a beautiful, messy mix of emotions!). Katy has accomplished so much in year five! She has learned to read proficiently. She can add and subtract simple equations. Her questions get more intricate- the answers not so simple or rote. She is making friends and learning her way in the world. Today, I am excited for Katy! I am excited to see her reach and surpass her potential! I love her independence. I love her sense of self-accomplishment. I love that she is feeding her mind and becoming a beautiful soul. Year Six is just beginning and I can't wait to see what the future holds! Happy, Happy Sixth Birthday, Katy!! We love you more than words can describe!! Wordless Wednesday- One more sleep 'til she's SIX!!!! Recently, I've been having fun sewing for ME!! I've sewn closet-fuls of cloths for Lil' Miss- literally!! Dresses, pants, leggings, skirts, tops, pajamas, jackets and Oh.So.Many.DRESSES!!!! I love sewing for Katy and I will continue to do so as long as she'll allow me. However, sewing for myself seems like the next likely step in my sewing journey. 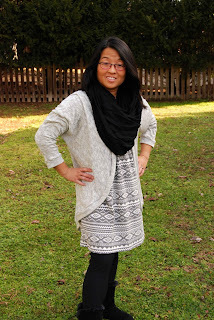 I've been testing some new women's patterns and participating in some fun blog tours. 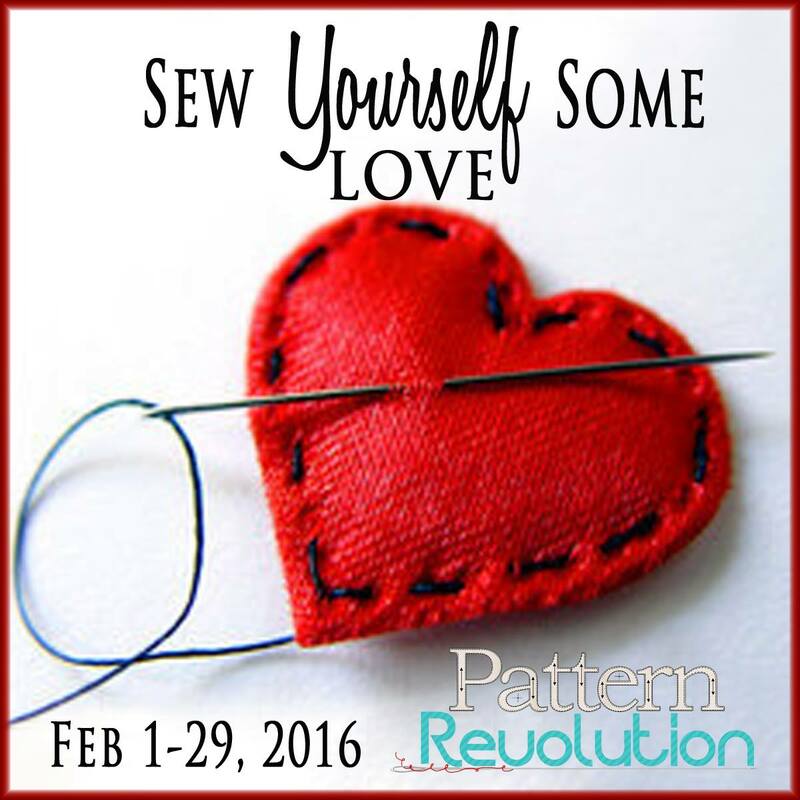 One of those fun blog tours is the Pattern Revolution "Sew Yourself Some Love" Blog Tour. Meant to promote the beauty within all of us, Pattern Revolution dedicates the whole month of February to encouraging sewists everywhere to, "...take a little bit of time (to) sew something for yourself- even just one thing!" It also reminds sewists to, "...take care of yourself so that you can better care for all the others in your life." So.... here goes... I'm sewing myself some love, this February...!! I've sewn several Patterns for Pirates PDF sewing patterns. However, just as Lil' Miss loves her dresses, so do I! Dresses make for easy dressing- throw one on and you are instantly put-together. I wear a dress at least once a week. So, it only seemed natural to "Sew myself some love" with a dress pattern- the Patterns for Pirates Boundless dress, to be exact! -The Patterns for Pirates Boundless dress is sized for XXS-Plus3X (A nice, large size range). -The Patterns for Pirates Boundless dress includes three sleeve options- short, 3/4 or long. -The Patterns for Pirates Boundless dress includes four skirt lengths- mini, dress, tea and maxi length. -The Patterns for Pirates Boundless dress PDF sewing pattern includes pattern pieces for the bodice, sleeves, optional in-seam pocket and cutting measurements for the skirt (less to print!). -The Patterns for Pirates Boundless dress PDF sewing pattern includes a sizing chart, fabric requirement chart, cutting chart, finished length chart. -The Patterns for Pirates Boundless dress includes step-by-step instructions with photographs for each step. -The Patterns for Pirates Boundless dress features no-trim pattern pieces. This pattern does NOT include layered pattern pieces- can I make this post my personal request to make the Boundless dress pattern pieces layered? Pretty please with a cherry on top?! ;-) (The Patterns for Pirates Boundless dress came out before the designer started doing layered pattern pieces). After reviewing the sizing chart, I sewed up an empire waist, 3/4 sleeve, dress-length, size medium Boundless dress with modifications. The cozy french terry was purchased locally at Hobby Lobby (on clearance-yay!). 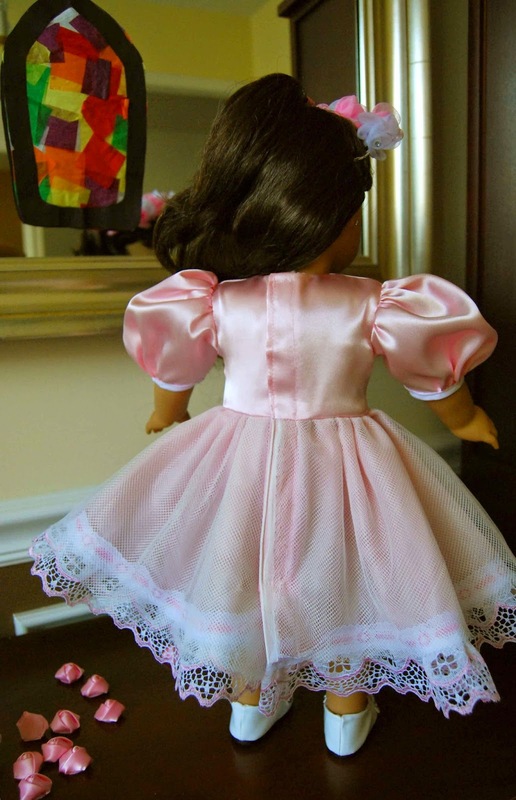 -I took length off of the skirt so that the dress would fit my petite frame. I wanted the dress to hit right at the knees. -I also took about 1" off of the bodice. In hindsight, I probably should have taken another 1/2" off in order to get a more empire fit. -Also, because I was using fabric from my stash, I did not have enough to fully line the bodice. Instead, I used bias tape to finish the neckline (flipped to the inside so that it's not visible from the outside). -Fabric choice matters (as it does in any pattern). In this case, the french terry fabric that I used was not super stretchy. Therefore, that affected the fit slightly. 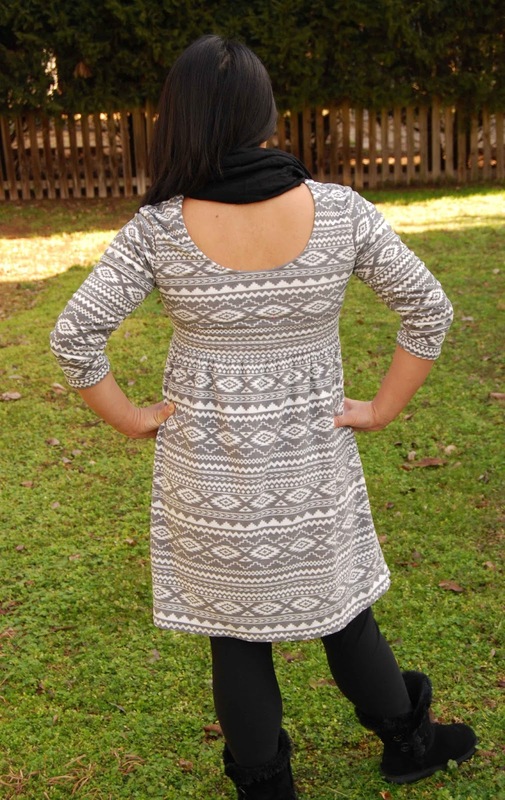 I love the ease and simplicity of the Patterns for Pirates Boundless dress. I enjoy the fact that the Boundless Dress includes two different waist options- at the waist and empire. 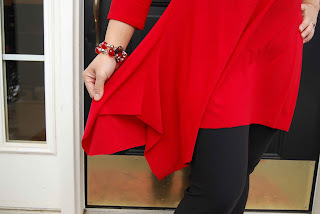 I appreciate a pattern that includes several sleeve options and several hemlines- that way, I feel like I can make multiple dresses and none of them will be the same! 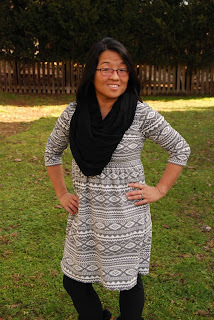 The Patterns for Pirates Boundless dress was simple to sew and was a breeze to whiz through my serger. The Boundless dress neckline is a bit lower than I typically wear (front and back bodice pieces are the same). So, next time I sew up a Boundless, I'll probably raise it a bit. However, paired with a scarf and a cozy cardi and I'm ready to go! I had sew much fun sewing myself some love with the Patterns for Pirates Boundless dress! Can I get a "What-what!" for those beautiful, matched stripes?!! Another wardrobe staple that I wear almost daily in the cooler months is a warm, comfy cardi. I've been wanting to try out Canadian designer, Jalie Patterns, for some time, now. So, when I saw that Jalie Patterns has the Cocoon Cardigan... well, it just seemed like the perfect match! -The Jalie Patterns Cocoon Cardigan is sized for girl's 2- women size 22. That means that with just one pattern, I can make myself AND my daughter matching Cocoon Cardigans! -The Jalie Patterns Cocoon Cardigan is written in both French and English. (the designer behind Jalie is French Canadian. This makes the tutorial a bit cumbersome and a little confusing to follow, but it sure hits a wide market!). -The Jalie Patterns Cocoon Cardigan PDF sewing pattern includes a sizing chart, a pattern layout diagram and fabric requirement chart. -The Jalie Patterns Cocoon Cardigan PDF sewing pattern includes numbered step-by-step instructions with English on the left and French on the right. Shaded diagrams accompany the instructions. After reviewing the sizing chart, I chose to sew up a size 8 Cocoon Cardigan. 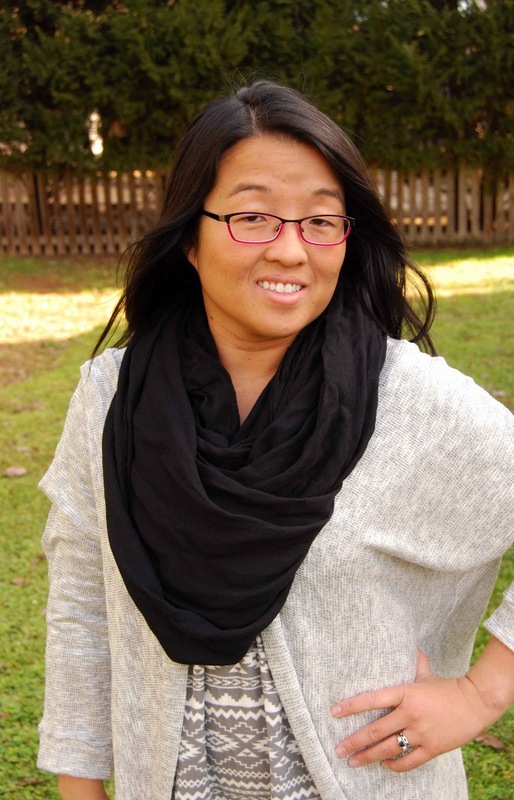 The gray sweater knit was purchased locally off the clearance table at Hobby Lobby (for less than $3/yard- score!). While I sewed The Jalie Patterns Cocoon Cardigan as instructed, I felt like it was REALLY long for my 5'-0" height. 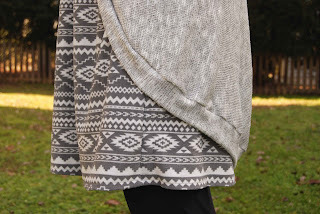 There is a shorten/lengthen line included in the pattern and I'll be sure to use that with my next Cocoon Cardigan that I sew up (and there WILL be a next time!). Also, while the Cocoon Cardigan is meant to be over-sized, I felt like the size 8 was a little too over-sized. Next time, I think I'll size down a bit, on top of shortening. 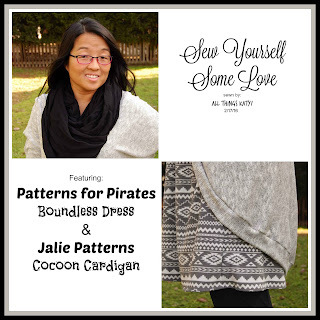 I had sew much fun sewing myself some love with the Jalie Patterns Cocoon Cardigan! So- or should I say, "sew"?- do you feel inspired...? I hope that you do! Join us through the whole blog tour and don't miss a day!!! Now, go ahead and SEW YOURSELF SOME LOVE!!!! 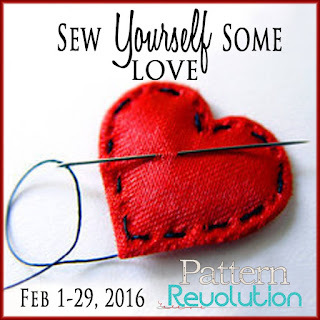 I want to say a special thanks to the brains behind Pattern Revolution for putting together the "Sew Yourself Some Love" blog tour. Thank you for coordinating patterns, posts, designers and bloggers. Most of all, thank you for inspiring, encouraging and creating! I truly enjoyed taking the time to sew myself some clothing that I will proudly wear! Thank you! So, in an effort to assist her, I gave her this hint, "North Carolina is (a)...."
Without missing a beat, Katy immediately exclaimed, "The South!" Hahaha- I'll give you partial credit on that one, Lil' Miss! 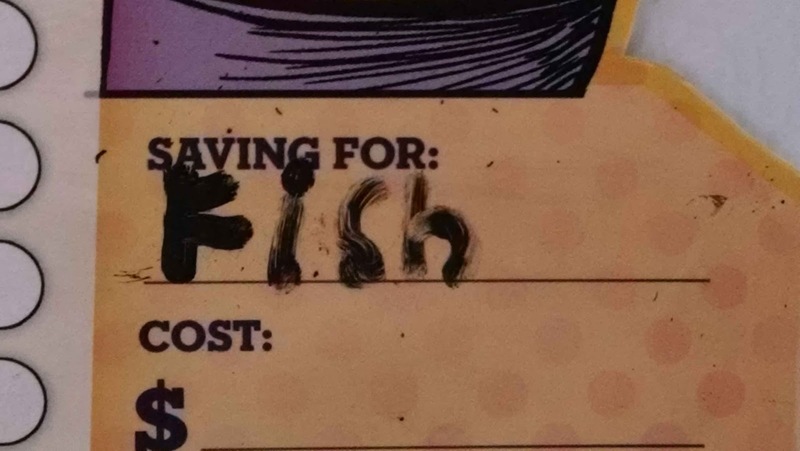 Katy spelled the word,"Fish" by sounding it out, all by herself. Apparently, Lil' Miss is saving... for a pet fish. Hello lovely readers and guests to All Things Katy! 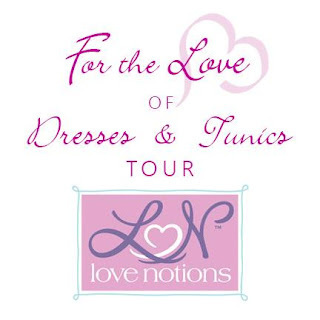 Today, it is my pleasure to be one of your last stops on the Love Notions For the Love of Dresses and Tunics Blog Tour. I have not one, not two but THREE pretties to share with you! 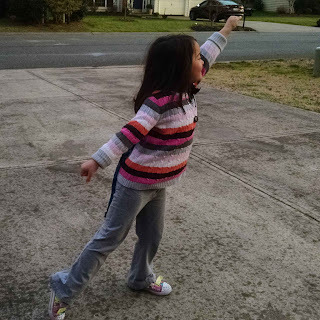 I sewed up the Laundry Day Tee, Pemberley Dress, and the Origami Tunic. Plus..... read all about a fun GIVEAWAY at the end of this post...! First up, the Love Notions Laundry Day Tee. 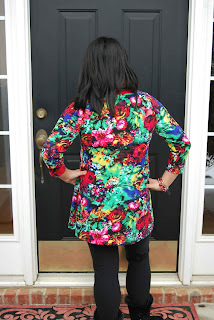 This quick, easy sew is a great wardrobe staple and so easy to sew up! 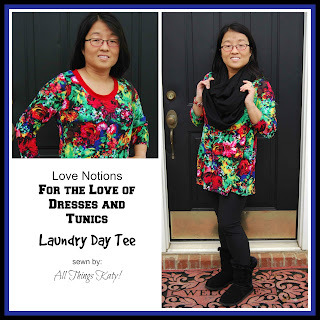 -The Love Notions Laundry Day Tee is a flattering a-line profile top. -The Love Notions Laundry Day Tee is sized for XS-XXXL. -The Love Notions Laundry Day Tee includes 3 sleeve lengths- short, 3/4 and long. 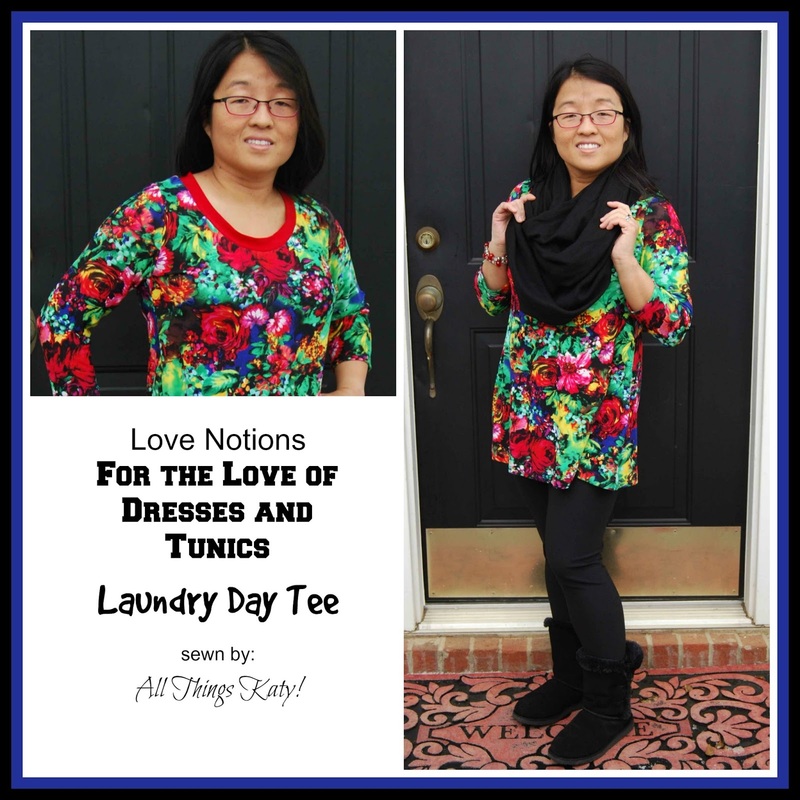 -The Love Notions Laundry Day Tee includes 2 hem lengths- top and tunic. -The Love Notions Laundry Day Tee includes 2 ways to finish the neck- scoop and V-neck. -The Love Notions Laundry Day Tee PDF sewing pattern includes a printing chart, layout, fabric requirement chart, and sizing chart. -The Love Notions Laundry Day Tee PDF sewing pattern includes 6-7 numbered steps(depending on what neckband you choose) with shaded diagrams. Easy, peasy! 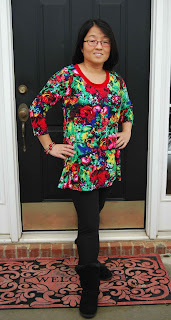 I sewed up a size small, 3/4 sleeve, scoop neckline Love Notions Laundry Day Tee as a tunic. I shortened the tunic length by one inch at the shorten line. I used a colorful, floral sweater knit purchased locally at Hancock Fabrics for the body of the tunic and a small amount of red ITY (also purchased at Hancock Fabrics) for the neckline. I really, really wanted to add a cowl to this pattern. However, I just didn't have enough fabric to make it work. The cowl add-on for the Love Notions Laundry Day Tee can be found here. The Laundry Day Tee sewed up so quickly! By shortening the tunic length by one inch to accommodate my *ahem* short stature, the hemline hit right just right- enough to cover but short enough to wear with some leggings! I love this pattern and I KNOW that I'll be making more in the near future! Second, we have the Pemberley Dress. I sewed this dress back at the end of the summer in preparation for my hubby's fancy birthday dinner. Then, right around the time of his birthday, hubs had an accident... and surgery.... and recovery.... So, needless to say, we never got a chance to go out for that fancy birthday dinner. 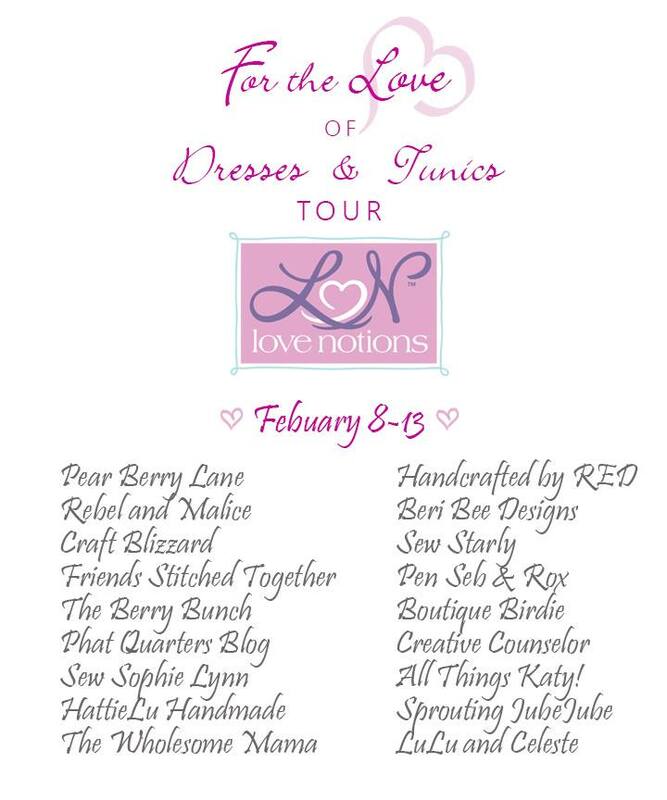 So, maybe I'll get a chance to wear my Love Notions Pemberley Dress for Valentine's Day...?!! -The Love Notions Pemberley Dress is an empire-waist bodice, meant to flatter most body types. 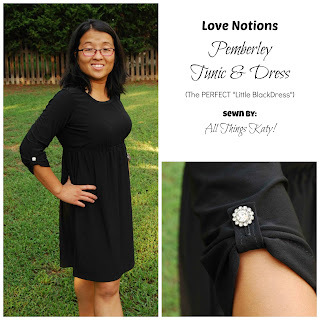 -The Love Notions Pemberley Dress is sized for XS-XXXL. -The Love Notions Pemberley Dress includes 2 lengths- tunic and dress. -The Love Notions Pemberley Dress includes 4 sleeve options- short, 3/4, long and bishop. -The Love Notions Pemberley Dress includes options for a tab sleeve and a shirt-tail hem detail. -The Love Notions Pemberley Dress has an elastic casing empire waistband where the gathers can be adjusted, as needed. -The Love Notions Pemberley Dress PDF sewing pattern includes a print chart, table, sizing chart and fabric requirement chart. -The Love Notions Pemberley Dress also includes a lengthen/shorten line and directions on how increase/decrease the bust pattern pieces. -The Love Notions Pemberley Dress PDF sewing pattern includes numbered directions with shaded diagrams to get you through the pattern. The pictured Pemberley Dress is a size small, dress length, 3/4 sleeve with button tab detail. I did NOT include the shirt-tail hem detail. 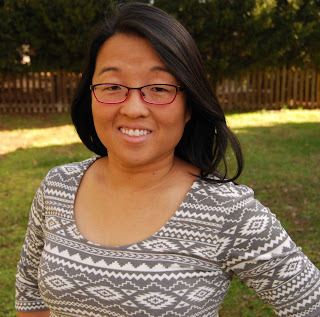 I purchased the black ITY knit at my local Hancock Fabrics. I purchase the button detail at Hobby Lobby. 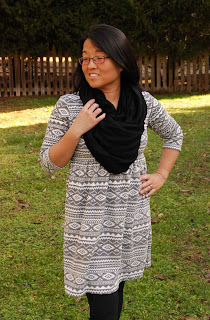 The Love Notions Pemberley Dress is a great, figure-flattering pattern. I love that it cinches in the right places and skims over all the wrong places. ;-). Sewing this up in ITY makes it feel fancy. However, I also have to note that this dress is super comfy to wear. The only thing uncomfortable about this outfit are the spike-high heels I'll end up wearing with them....! (once again, #shortgirlproblems ;-). 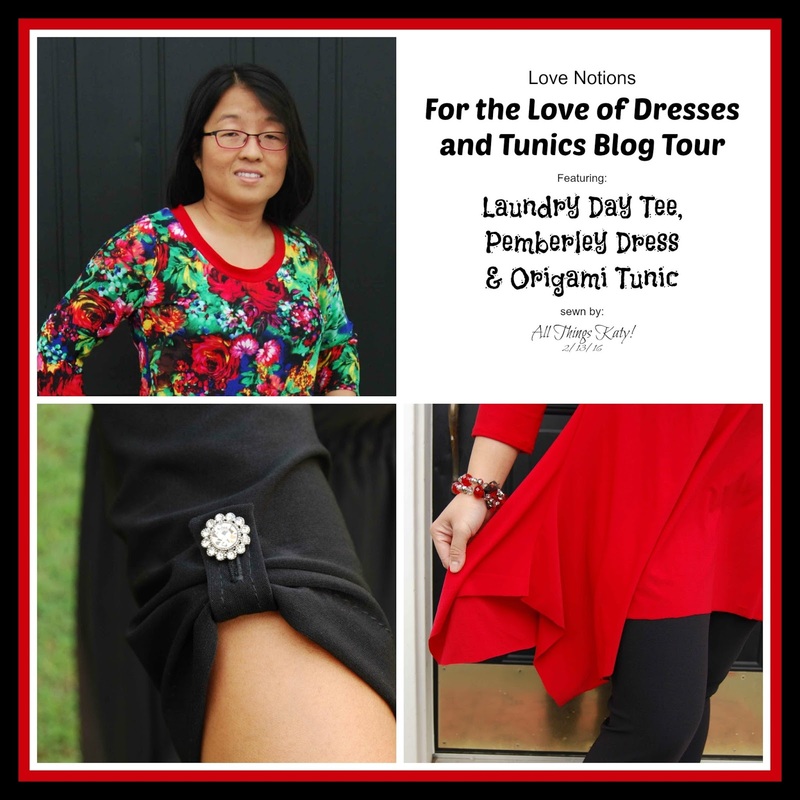 Now, onto my third and final Love Notions pattern for the "For the Love of Dresses and Tunics" blog tour- the Origami Tunic! (Last pattern for the tour, but definitely not my last Love Notions pattern- I'll be sewing up plenty more of those!). This is the pattern that I am supposed to be highlighting. From the smile on my face, you can tell that I LOVED Love Notions Origami Tunic!! -The Love Notions Origami Tunic is a flattering top that includes a fun handkerchief hem detail. -The Love Notions Origami Tunic is sized for XS-XXXL. -The Love Notions Origami Tunic includes 2 hemlines- top and tunic. -The Love Notions Origami Tunic includes 2 profiles- handkerchief hemline or more form-fitting. -The Love Notions Origami Tunic includes 3 sleeve lengths- short, 3/4 or long. -The Love Notions Origami Tunic includes 2 neckline options- banded or cowl. 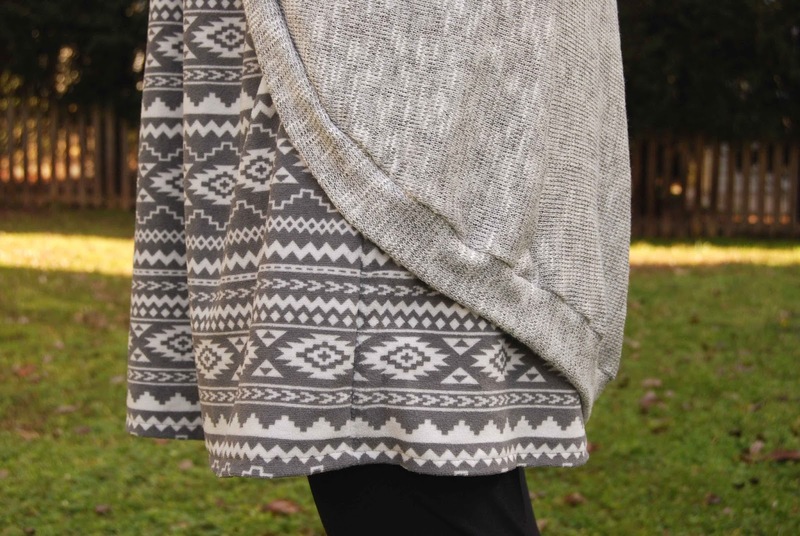 -The Love Notions Origami Tunic also includes pattern pieces and instruction to create a fun cardigan. 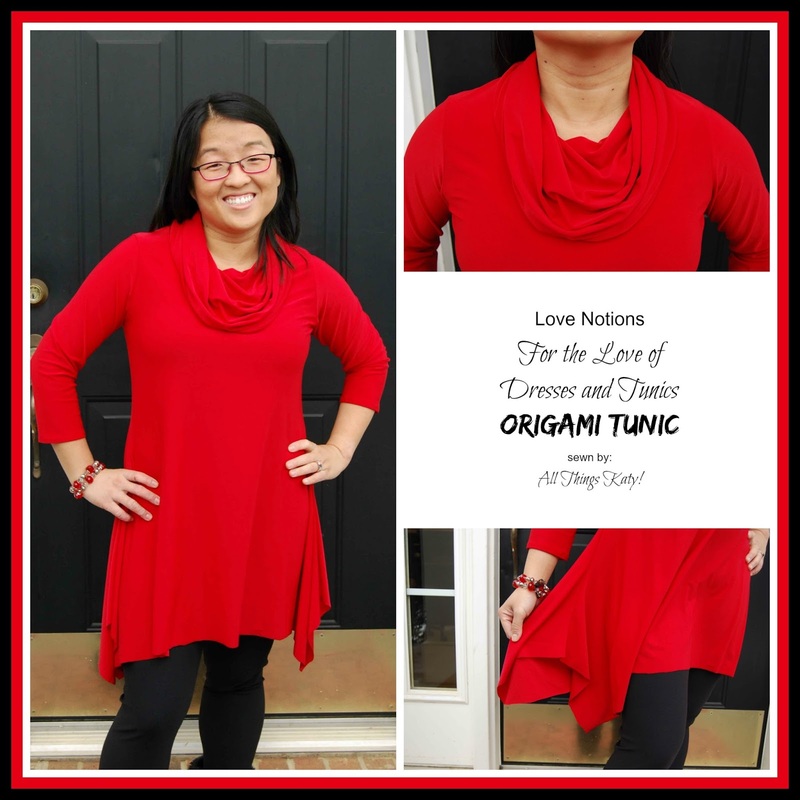 -The Love Notions Origami Tunic PDF sewing pattern includes a printing chart, layout, fabric requirement chart, sizing chart and cutting chart (for non pattern pieces). 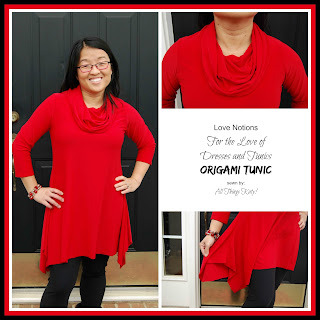 -The Love Notions Origami Tunic also includes a shorten/lengthen line and directions on how to get the best fit. 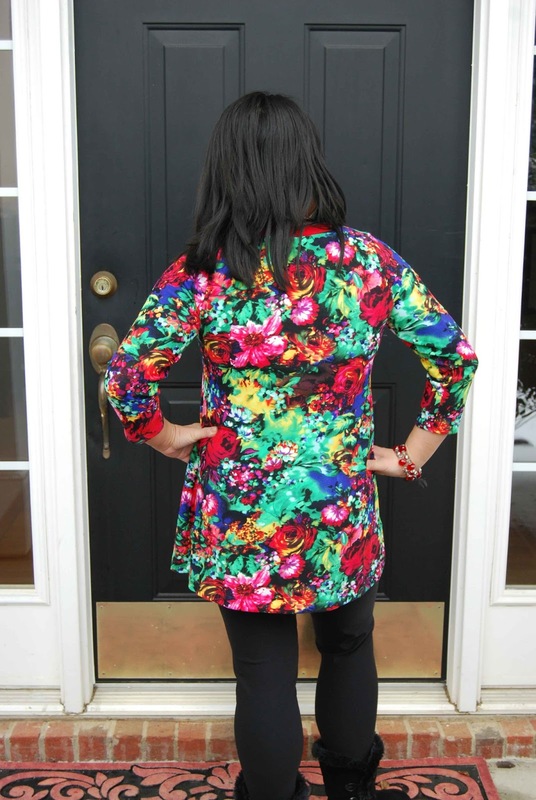 -The Love Notions Origami Tunic PDF sewing pattern includes numbered directions with photographs for each step. I sewed up a size small, tunic length, handkerchief hem, cowl neck, 3/4 sleeve Love Notions Origami Tunic. I did not shorten the length of the bodice as I wanted a longer tunic. In retrospect, I kind of wish I had lengthened the pattern pieces to create a dress out of this pattern (next time!)! The red ITY knit fabric was purchased awhile ago from Hancock Fabric. I used my serger for the construction of the Love Notions Origami Tunic- everything but the sleeve hems. Shhh... don't tell... but, I didn't even bother to hem the handkerchief hemline.... this makes it SUPER quick to sew up!! 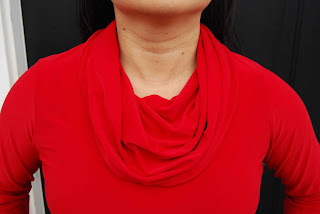 I love that the cowl finishes the neckline (no hemming!) and creates a built in "scarf." So, in conclusion, you really can't go wrong with a Love Notions PDF sewing pattern. 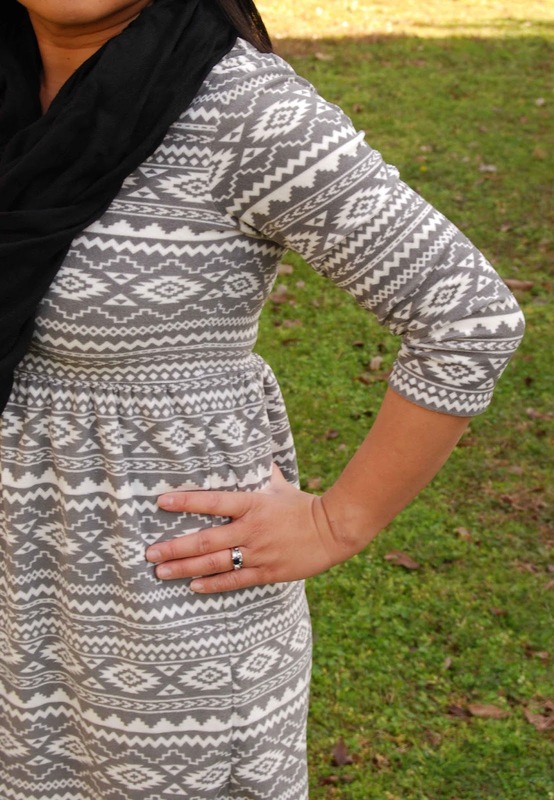 From daytime to an evening out... so many possibilities with all of the Love Notions patterns! I've already worn the Laundry Day Tee and Origami Tunic to work with dress slacks and boots. Swap the slack out for leggings and I'm ready for some weekend/evening fun! Of course, my fancy Pemberley Dress is perfect for the wardrobe essential "Little black dress.". They are simple to create, easy to follow and very figure-friendly. Each pattern has the potential to be all your own- just pick the fabric and trims and make it personal! 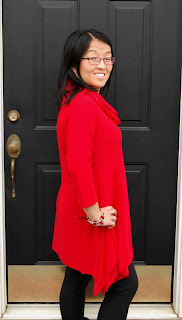 Whether you wear that Love Notions Dress or Tunic on a hot Valentine's date, or tame it down to wear to the office, or around the house, you will look and feel great!! Have fun! Thank you so much for stopping by! If you'd like to be inspired by some other great Love Notions patterns, please feel free to visit any (and all!) 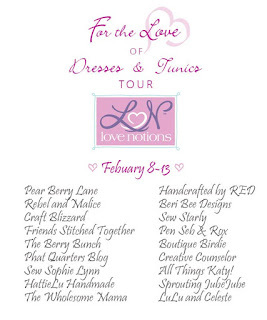 of the following talented sewists and bloggers of the Love Notions "For the Love of Dresses and Tunics" Blog tour! Please join the Facebook Group for a special code to purchase the Laundry Day Tee pattern, tips, tricks, support and inspiration! Now, for the fun giveaway....!!! 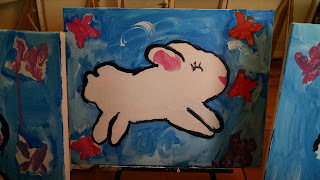 Did you feel inspired by some of the Love Notions creations that you saw, above? Well, now is your chance to enter to win your choice of 5 Love Notions patterns AND a $50 gift card to Girl Charlee Fabrics...! Woohooo!! Happy sewing!! 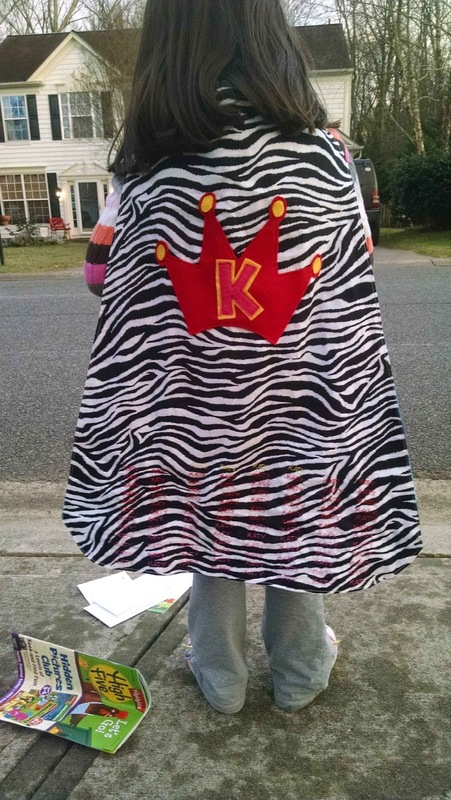 "It's a bird, it's a plane, no, it's SUPER-100-DAYS-SMARTER Katy!!!" Katy's Super cape- with her name on it 100 times! It's hard to believe, but our Lil' Miss has been in Kindergarten for 100 whole days! She is growing and learning and becoming more an more independent each day! She's learning to add and subtract. She is consistently reading at a C/D reading level. She's making new friends and she's more and more becoming the her own person! We have been so, so, SO blessed with her teacher, Mrs. Mitchell. Mrs. Mitchell has been kind and caring and loving (pretty much whatever you would envision a perfect Kindergarten teacher to be ;-). We are so proud of Katy's achievements both academically and socially!! When I am 100 years old.... "I will have a bunny. 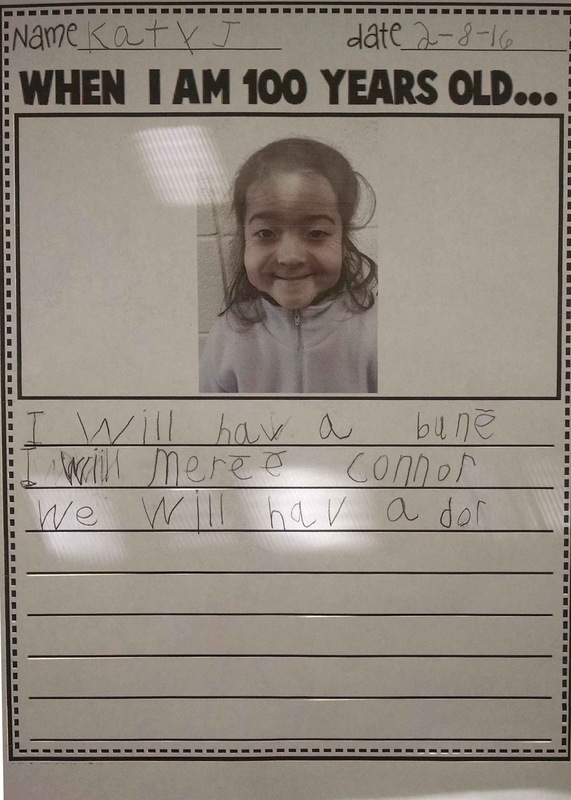 I will marry Connor. 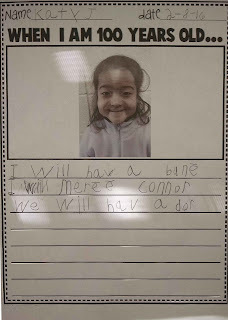 We will have a boy."